The contract for donation donor retreat immediately and free real estate donations, which it accepted. "Immediately" means that the contract between the living and the effect occurs immediately, unlike a will, which raises its action only after its opening. No charge for the contract is a manifestation of animus donandi - the intention of the donor to show generosity. Animus donandi is enshrined in donations weight where weight itself however does not make the contract in consideration. According to Law on Obligations and Contracts: "Contracts may be amended, suspended, canceled or rescission only by mutual consent of the parties or on grounds prescribed by law." And because the gift is real estate or limited rights in rem over such property / real property are: land, plants, buildings and other structures and does everything naturally or by the action of man is firmly fixed to the ground or to the structure . ), this should be applied as follows: contracts for transfer of ownership or establishing other real rights on real estate must be carried out with the deed. 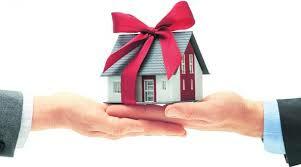 The parties to the deed of donation of real estate contributor and gifted. Parties to the notary proceedings are persons on whose behalf requests the notarial act. Participating in notary proceedings are persons whose personal statement certifying notary. The donor must be the owner of real estate donations and is mentally incompetent. Donation disclaimer, lending and securing foreign obligations by pledge, mortgage or guarantee of minors are null and void. This does not apply to transactions of married minors, for which only the limitation on the Family Code. Gifted may be a natural or legal person or state. If gifted individual is legally it must be duly represented. The promise of a donation does not produce action, and the donation of future property is void. Void is the donation when it or a motive, only because of which it is made, are contrary to law or morality, as well as the conditions or severity are impossible (Art. 226 of the CPA). The donation of a property can be done by proxy holder of the right of ownership or limited rights in rem. Required power of attorney must list all data individualizing the subject of the transaction (real estate), also mentioned in the contract for transfer and are recorded in the deed to the seller. The property must be listed, be referred to its borders, its neighbors and so on.. The power of attorney must be notarized signature of the authorizing (Art. 37 of the CPA). The parties profess the deal before the notary, in whose area is real / s property / s covered by the grant (art. 570 CCP). Entries markings and deletions on real estate are carried out by order of the judge for the entries from the registry office in whose area the property is located (art. 570, para. 1, sentence. Secondly CCP), if the properties are few and are areas of various district courts, the deed must be recorded in the registry offices of each of these areas. Individuals or their representatives, whose statements are contained in the project must appear in person before the notary, who before drawing up the act verify the identity, legal capacity and representation of those appearing before him or her (art. 578, para. 4 of the CCP ). The preparation of products subject to registration deeds done only at the office of the notary, and then during working hours (art. 573, para. 2 CCP).